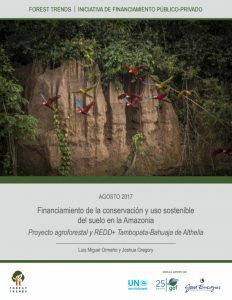 Peru’s National Service of Natural Protected Areas (SERNANP), in co-management with the Asociación para la Investigación y Desarrollo Integral (AIDER) and with financial support from Althelia Ecosphere, is implementing the REDD+ Tambopata Bahuaja-Sonene Project as part of the Partial Administration Contract for the Tambopata National Reserve (RNTAMB) and the Bahuaja-Sonene National Park (PNBS), both NPAs located in the Madre de Dios region. The partial administration contract granted to AIDER is a co-management model that allows the articulation of collaborative alliances between the private sector, civil society and the State for the conservation of internationally significant forest eco¬systems. The implementation of the Tambopata Bahuaja-Sonene REDD+ Project, involves installing agroforestry systems and valuing the ecosystem services provided by these protected areas; it also helps finance biological monitoring, research, and control and surveillance processes that are crucial to meet the conservation objectives of these NPAs. At the same time, it seeks to stabilize the families living in the NPAs buffer zones by creating economic opportunities as viable alternatives to other illegal activities (coca growing, mining) or slash and burn agricultural practices (one of the main drivers of deforestation), thereby improving the livelihood of these families, promoting them to become conservation allies.